Massive: not just for 'yoi' noises. Native Instruments' Massive synth has earned itself something of a stigma thanks to its formant-sweeping 'yoi' oscillators and general overuse in dubstep. 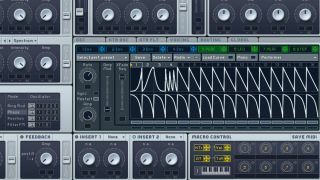 However, its powerful wavetable oscillators can provide nasty, twisted harmonic bass sounds to suit all electronic genres, while its clever 'performer' modulation curves enable you to precisely draw in your own modulation shapes, fitting your parameter movements to your track's tempo. Here we're only using Massive's built-in distortion, EQ and effects to treat our final tone - with just a touch of mid/side filtering from an external plugin to keep the lows and mids centred in the mix. Although this proves how powerful the synth's output can be in isolation, Massive has been used in countless mainstream tracks, so its raw sound is distinctive and highly recognisable. Experiment with external plugins (distortion, EQ, wideners and modulation effects, for example)to customise the sound further. Step 1: Here's a bass riff coming from NI Massive's initial blank preset - a plain and static square/saw tone. Contrasting MIDI note lengths and heavy portamento inside the synth gives interest to the simple pattern. Sidechaining is added using XFer's LFOTool. Step 2: Changing the first oscillator to the Kangaroo wavetable gives us a dull but rasping tone. We introduce subtle growling movement over longer notes by using Massive's Performer LFO to modulate the wavetable position parameter, after designing a custom wave shape for the modulation. Step 3: For more top-end texture, we turn up the second oscillator and select the Scrapyard wavetable. Again, our custom Performer curve modulates the wavetable position for movement and grit. Even more treble fizz is added by mixing in a touch of white noise from Massive's Noise oscillator. Step 4: The Frozen wavetable is now mixed in via the third oscillator, and again, its wavetable position is modulated by our Performer. This thickens the patch but removes some of that original dirtiness - this oscillator can instead be mixed in and out of an arrangement for variation. Step 5: Our bass lacks aggression, but here's the magic: Massive's Parabolic Shaper and Classic Tube effects drive the sound hard, crunching the separate oscillators together and accentuating the wavetables' modulation for a grittier effect. Built-in EQ adds high-mids and treble for bite. Step 6: To widen our bass patch, we blend in some of Massive's Dimension Expander effect. An external EQ plugin in M/S mode high-passes the side signal of the bass at around 500Hz. Our bass's lows and mids remain solid and mono, but the upper frequencies are widened.